Open edition goutelette prints and lithographs taken from originals by one of the most influential European botanical artists of all time. Georg Ehret began his working life as a gardener's apprentice near Heidelberg. His first illustrations were in collaboration with Carl Linnaeus and George Clifford in 1735-1736. 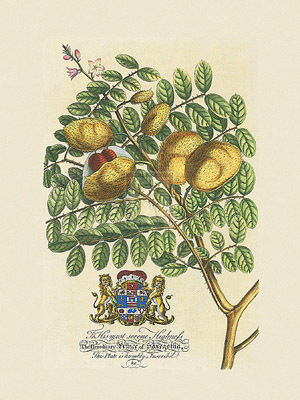 Clifford, a wealthy Dutch banker and governor of the Dutch East India Company was a keen botanist with a large herbarium. He had the income to attract the talents of botanists such as Linnaeus and artists like Ehret. Together at the Clifford estate, Hartecamp, which is located south of Haarlem in Heemstede near Bennebroek, they produced Hortus Cliffortianus in 1738, a masterpiece of early botanical literature. 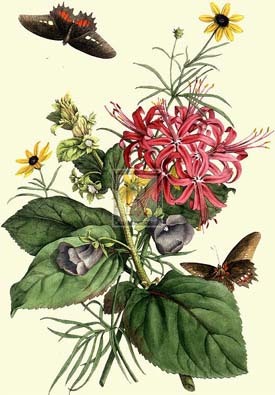 As a result of exploitation by Johann Wilhelm Weinmann, Ehret finished only 500 plates of a 1,000 plate commission and moved to England where he illustrated many of the more spectacular plants that were in cultivation. His original art work may be found at the Natural History Museum in London, the Royal Botanic Gardens, Kew, The Royal Society, London, the Lindley Library at the Royal Horticultural Society, the Victoria and Albert Museum, and at the University Library of Erlangen. The genus Ehretia was named in his honour.